Meet the #IWantToWork campaign, a group of passionate, talented young people with disabilities eager to go to work and become productive, independent, taxpaying citizens. They use the hash tag #IWantToWork on social media to build legislative, business and public support to change funding and policies to help young people with disabilities get part time and summer jobs and paid internships. This work experience will prepare them for the job market when they finish high school. They are sorely lacking those opportunities now. 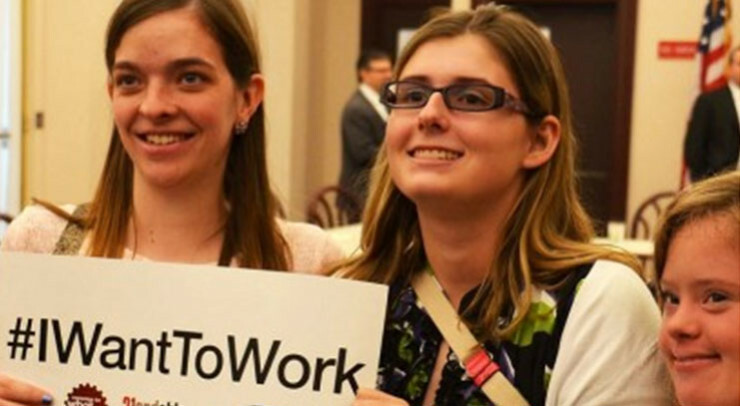 The young people laid the foundation of the #IWantToWorkcampaign near the end of the 2013-2014 legislative session with a selfie campaign on Facebook, Twitter and Instagram. It was a great way to introduce themselves to legislators as they seek policy changes and additional funding for the Bureau of Occupational Rehabilitation. They took selfies with dozens of legislators during visits to their Harrisburg and district offices. One of their key legislative champions is Sen. Lisa Baker (R-Luzerne), chair of the Senate Labor and Industry Committee. Sen. Baker demonstrated her commitment to the#IWantToWork cause in a video produced by the Arc of Luzerne County. Click here to view it. The campaign is ready to kick into high gear during the 2015-2016 session as a priority of the Campaign for What Works. Its staff is composed of persons with disabilities from across Pennsylvania, including a campaign manager, social media director, communications associate, regional directors, and self-advocate lobbyists.